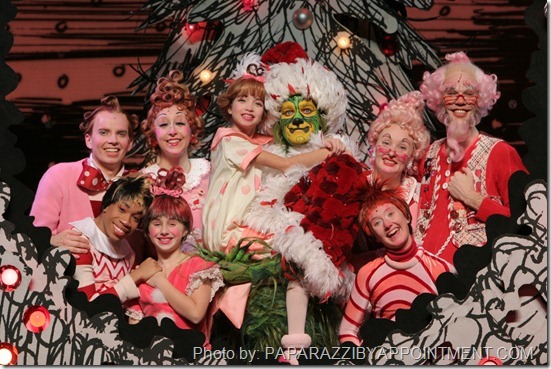 It wouldn’t be Christmas in Boston without the arrival of a family-friendly holiday-themed theater experience. This year, it’s Elf The Musical, and we’ve been offered tickets for review, plus a giveaway for a lucky family (see below). I have a confession: I have never seen Elf the movie. Nope. Not once. I went into this one blind, but I thought the kids would really enjoy it and I was right. We all enjoyed ourselves and it was a great time out as a family getting into the holiday spirit. ELF The Musical is the hilarious tale of Buddy, a young orphan child who mistakenly crawls into Santa’s bag of gifts and is transported back to the North Pole. Unaware that he is actually human, Buddy’s enormous size and poor toy-making abilities cause him to face the truth. With Santa’s permission, Buddy embarks on a journey to New York City to find his birth father, discover his true identity, and help New York remember their inner ELF. 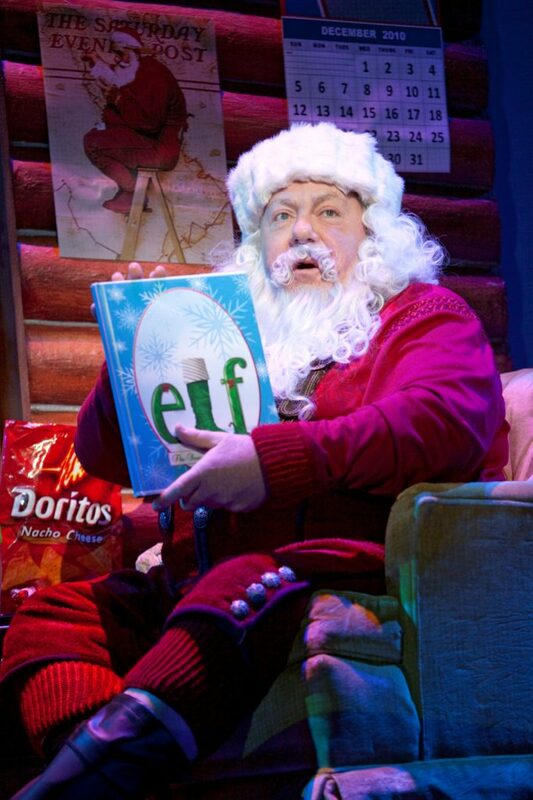 George Wendt (Norm, of Cheers fame, among plenty of other roles) is returning to the tour playing the jolly old elf (he was the original Santa on Broadway in 2010), and I was excited to see him in the role. He didn’t disappoint! The musical also features Erik Gratton (Buddy), Bernard Dotson (Store Manager), Cynthia Ferrer (Emily), Veronica J. Kuehn (Jovie), Trey Middleton (Michael), Ruth Pferdehirt (Deb), Christopher M. Russo (Walter), Danny Rutigliano (Mr. Greenway) and Ken Clement (Santa Standby). The cast also includes Darren Biggart, Allyson Carr, Allyson Kaye Daniel, Paul Ianniello, Eric Anthony Johnson, Chandon Jones, Drew King, Andrew Kruep, Emily Larger, Eric Jon Mahlum, Frankie Paparone, Emily Jeanne Phillips, Shaun Repetto, Wyatt Rogers, Morgan Rose and Emily Grace Tucker. 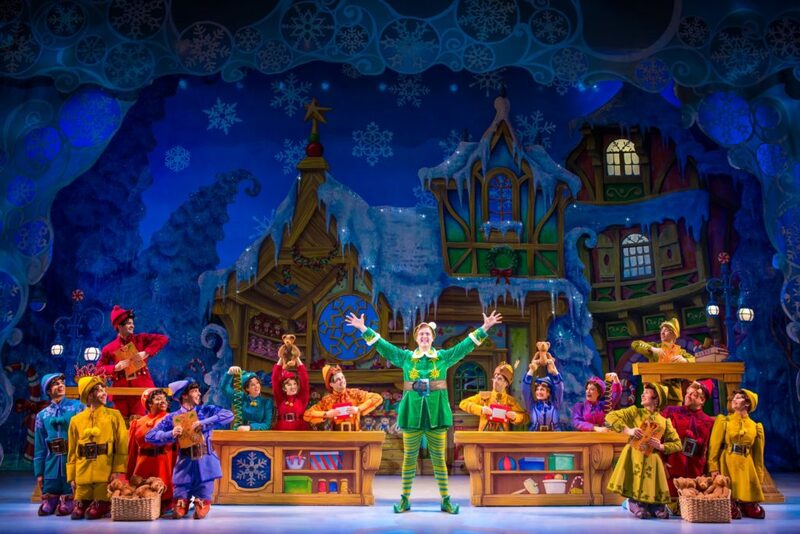 There are a few things I think families should know about Elf The Musical. First off, the sets are gorgeous. They are bright and bold and colorful. Each time they revealed a new set, the little girl behind me squealed with delight. The story is silly and fun and the music is catchy. All that said, I had a few moments that made me cringe for people with really littles in the audience. There’s some mild language – friggin’ and bitchy come to mind – and quite a bit of innuendo that most kids will miss. The story relies very heavily on the premise that no one believes in Santa Claus. This is a huge pet peeve of mine in Christmas stories, but I thought it was particularly over the top in this case. If kids aren’t questioning, they may be before things are done. Sure, in the end (spoiler alert! ), everyone becomes a believer, but I’m not sure it’s enough to make up for all of the eye-rolling and snarking about Santa beforehand. My kids are tweens, so most of this didn’t bother me. My youngest is still a believer, though, and so I was pretty uncomfortable with how much anti-belief talk went on. It’s just something to keep in mind before you plan to go. We definitely would recommend it and it’s hard to find something that we ALL enjoy, so Elf The Musical was a big win in that regard. But I am a believer in knowing what you’re getting yourself into! Performances of Elf The Musical are Tuesday, November 28 through Sunday, December 10: Tuesday through Saturday evenings at 7:00 pm, Sunday evenings at 6:00 pm, with matinees on Saturdays at 2:00 pm and Sundays at 1:00 pm. Tickets prices begin at $37.50 and are on sale now at the Boch Center Box Office, Bochcenter.org, by calling (800) 982-ARTS (2787), and via Ticketmaster. Groups of 10 or more may reserve tickets now by contacting Boch Center Group Sales at (617) 532-1116 or groups@bochcenter.org. Disclosure: We received tickets for review purposes. Giveaway tickets are provided by the giveaway sponsor. There was no other compensation provided and all opinions are our own. Decorating the tree… doesn’t feel like Christmas until the tree is up!!! My favorite holiday tradition is decorating the tree and home with the kids. I love the movie so much! I like Christmas movies most. Putting up the tree with my family!!! Decorating the tree for sure! I love looking at all the ornaments and thinking about the memories associated with them! Decorating the tree…I love thinking about the memories from all the ornaments. I love decorating a gingerbread house each year with my family. Making over 109 dozen Christmas cookies! We have a few. One of my favorites is going to the Enchanted village at Jordan’s Furniture. Stockings! My MIL stuffs all the stockings and Christmas morning, we usually unwrap all the individually wrapped items and have a good laugh together. We go to the enchanted village every year! I love baking cookies with my family! I do a Christmas Yankee swap with in-laws on Christmas Eve! So much fun!